Roucou oil is an amazing exotic oil, unusually rare in cosmetology. 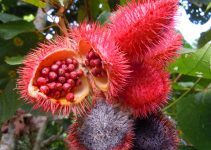 It is extracted from the seeds of roucou tree, also called Bixa Orellana, which comes from South America. Currently, Roucou trees grow also in Polynesia and this is mainly where the roucou oil for skin care of body and face, but (most of all) also hair, comes from. 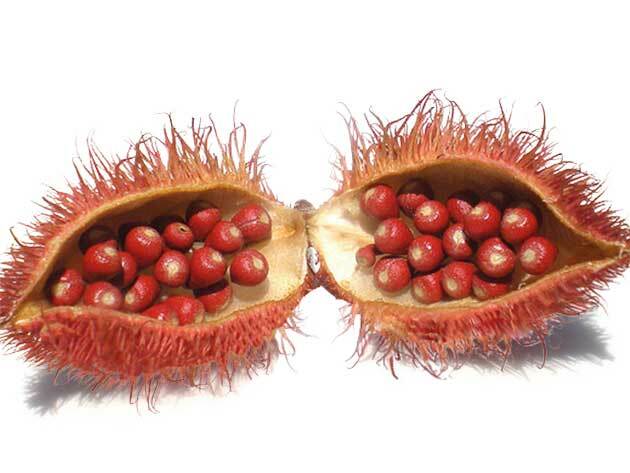 Oil obtained from roucou seeds is a diversity of valuable ingredients for hair. If used for hair oil treatment, this cosmetic can provide deep nourishment, regeneration and gloss. What does contain and what is the impact on hair of roucou oil? – Roucou oil is rich in EFA (Essential Fatty Acids) such as omega-3 and omega-6. For this reason it perfectly regenerates damaged, dry and weak hair (so called high porosity hair). 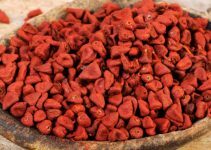 – Roucou oil is rich in beta-carotene. For this reason it inhibits ageing processes in hair and skin, contains natural UV filter, that protects hair against damaging sun radiation. What is more, beta-carotene stimulates collagen fibres production and normalises work of sebaceous glands. Thanks to this feature, scalp regains hydration and overproduction of sebum is minimised. – Roucou oil contains also a lot of valuable minerals for hair. Magnesium (supports keratin production – main lumber of the hair), selenium (prevents hair loss), calcium (contributes to enhanced hair growth, makes absorption of other essential compounds easier). 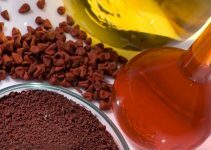 – Roucou oil contains really important for beauty and health of hair, vitamins, like vitamin E (thanks to which hair become strong, glossy and stop falling out) and vitamin A (which supports the cells renewal cycle in the organism and stimulates hair growth, but also protects hair against harmful impact of atmospheric factors and toxins). Roucou oil should be applied both on hair and scalp. The longer it is left on the scalp – the better for health of scalp and beauty of the strands. Hair oiling with roucou oil can be performed before every hair wash (at least once a week). Thanks to it, you provide hair with healthy growth, regeneration, nourishment and gloss. Hair grow healthy, bouncy and become less subjected to damages.